Huge strain is being put on the current model of management as it is destroying talent, ignoring customers and slowly suffocating the organization. Chris Fussell, Chief Growth Officer at the McChrystal Group, explained how the United States Joint Special Operations Task Force (JSOTF) restructured their operating model to work efficiently in an environment where they enemy had changed theirs. With the advent of instant, ubiquitous communication Al Qaida was able to restructure their organization instantly, every 24 hours, rendering successful missions by the US Special Forces unsuccessful as they had no effect on a constantly shifting enemy. Al Qaida were so effective at management, that even the best tuned hierarchical organization in the world could not compete against their decentralized model. JSOTF saw that they needed to become as distributed in their operations and management as their environment. Fussell explained how the solution was to relinquish hierarchical control from the top of the organization, allowing for every talented team of employees to make their own decisions based on the immediate signals they were getting from their enemy (no need to run up the chain of command to ask for permission). In order to have everyone make the right decisions immediately, everyone needed to have the right information. So, they needed to decentralize control by decentralizing information. And keeping every team updated on the environment they were operating in as often as it changed. In the case of JSOTF, this was every 24 hours. Chris Fussell made it very clear: JSOTF didn’t change because of the availability of new management theory or isolated internal organizational curiosity. 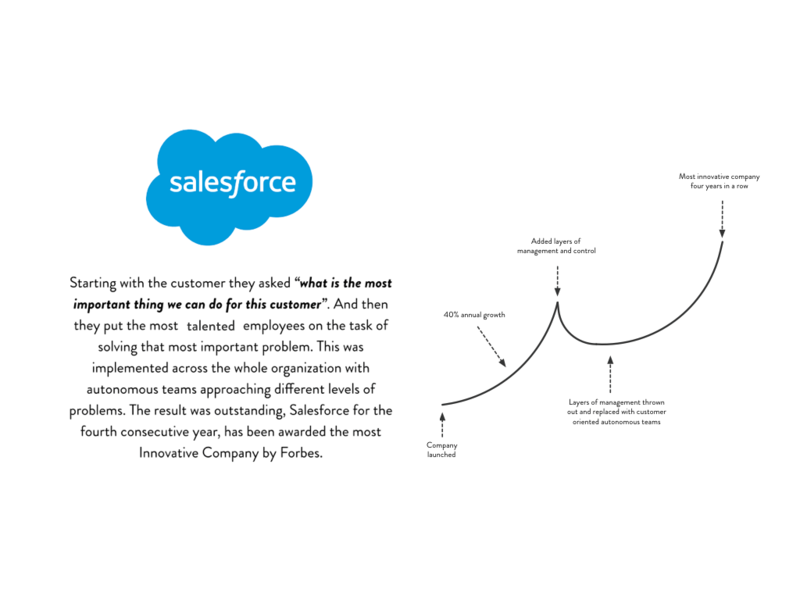 They changed because their customer changed, and the only way for them to stay effective was to figure out how to mirror the speed and agility of the customer networks. Working with companies the McChrystal Group is using the same lens, helping organizations understand their environment and how to operate in it. 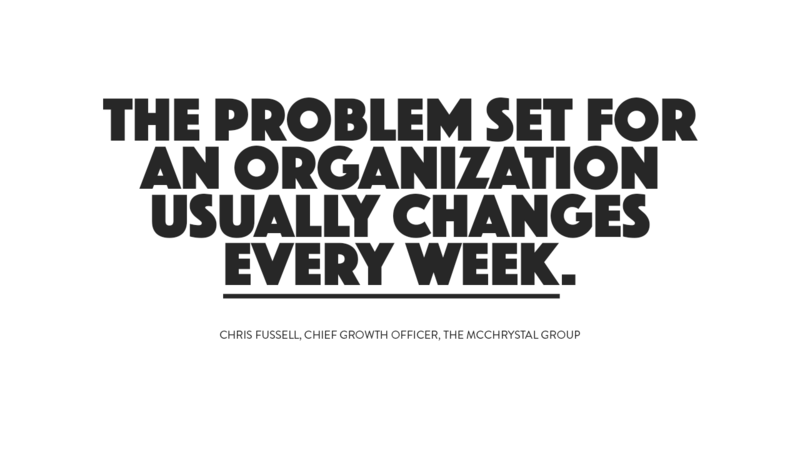 Fussell explained that even if the speed is a bit slower, the problem set of an organization usually changes on average every week. Jon Husband, author of Wirearchy, put it in other words. Companies need to decentralize information and control. Using his definition of Wirearchy: “a dynamic two-way flow of power and authority based on knowledge, trust, credibility and a focus on results, enabled by interconnected people and technology”. And I would personally ad customers to that – companies are holding their customers hostage in product and services structures that are designed for company architecture and McKinsey-ism (McKinsey-ism = customer orientation is only an option if it is the most profitable and most immediate option). Mark Raheja, of August, pointed out that this hostage taking of talent creates disengaged employees. Talented, self-thinking individuals are not allowed to make their own decisions because the company has not set in place the structure that allows for information to flow and grow. This current model protects the hoarding of information, incentivizing individuals to protect and keep information to gain personal power and control. This is hurting the organization and un-abling talents to unleash value and wealth for the customer and the firm. Employees are disengaging because they are getting hired for their big talent, only to be robbed of this talent and their ability to perform. Neil Perkin, of the consultancy Only Dead Fish added to all of this, having a lot of experience designing and working with autonomous teams inside hierarchical organizations. Saying that even if you get the team to work in this setting they will be under constant attack by the rest of the organization seeing them as foreign element in their bloodstream that they need to control. The realization that your company is operating in a decentralized networked environment also changes our relationship to strategic tools. Companies like predictability and strategy has created the illusion of control. But, barriers protecting companies operating model and product structures have been vaporized and we need to reach the acknowledgment that we are not, have not and cannot control the environments we operate in. We can design for it, but we can’t control it. In essence you’re left with this idea that there will be two types of companies. Those that can control their environment and be the god-maker. And those that acknowledge that the comfortable idea of being able to control your environment is an illusion. The old management model is a control mechanism subdividing talent into compartments where top-management destroys their ability to create value. Enabling companies are driving information rapidly out to front-line self-organizing teams in order for them to operate autonomously and react instantly to changes in customer demand patterns. Employees given the opportunity to use their talent unleash massive wealth for the corporation.